This is poetry full of absolute physical celebration - galley stoves, flour, slabs of meat, pollens, a tarnished boat - a gift, really. By turns these poems are violent and sweet, representing many journeys. They are surreal, joyous, startling, and fierce. 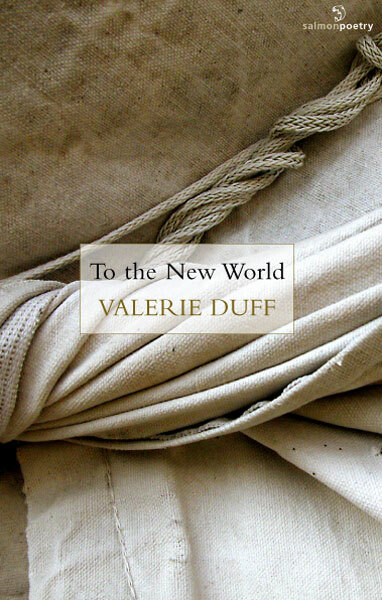 "I am only here in passing," writes Valerie Duff in "Urban Blue," and this line could stand as a motto for her passage to the "new world" delineated in the sharp-edged, ironic, and canny poems of this collection. This is a book of liminality, of speakers at emotional and spiritual thresholds of all sorts, certain only that there is nothing absolutely lasting. Thus this is also a book of departures and arrivals, of highways and sea-lanes, of taxis, gates, and doorways, and what is sometimes glimpsed in the rearview mirror. Here, in other words, is a vivid portrait of how we move and shift and pass our days, each heading for better or worse to our own new worlds. Valerie Duff is the poetry editor for Salamander Magazine, and she has received St. Botolph and Massachusetts Cultural Council grants for her poetry. She earned her masters degree in creative writing from Boston University and Trinity College, Dublin. Her poems have appeared in Ploughshares, Harvard Review, PN Review AGNI, Zoland Poetry: an Annual of Poems, Translations and Interviews, and elsewhere; her book reviews have appeared in Salamander, Bostonia, and PN Review. Her short play, "The Means Which Enable Me to Work," was performed in an Arlington New Plays Festival in 2004. Valerie is a freelance writer and editor for Bedford/St. Martin's Press. She lives in Boston with her husband and two children. Jackal. In a field next door, the cat lady claps her hands. and they fly in hundreds towards her lap, rub her apron. Pipe the flute, sing the pastoral. fall air, religion, deeply Southern. The redboard church. I knew I'd head Northward through my own weather.